Strengthen the mind-body connection and reach your fitness goals with Pilates classes from Fit Athletic Club! Find a safe yet challenging way to hone and tone your body — explore Pilates classes today with Fit Athletic Club! We offer a number of group fitness classes at our convenient Houston gyms, including Pilates, one of the most popular fitness methods in the country. Whether you are a beginner or an advanced practitioner, you can hone your skills here at Fit Athletic Club. Let our certified trainers walk you through how to create core strength and stability, as well as improve your balance, flexibility, agility, and more. You will challenge your body while concentrating on your breath for a worthwhile strength training that can also functioning as a low-stress, meditative exercise. Pilates is a fitness method that was developed by Joseph Pilates in the 20th century. The practice focuses on smooth, controlled movements and mind-body connection, with many options and modifications available for people of all fitness levels and abilities. Some classes utilize specially made exercise machines, while others simply use a floor mat. All of the Pilates classes we offer at our Houston fitness centers can be modified for your personal fitness level, and all practitioners are welcome, whether you are trying Pilates for the first time or making Fit Athletic Club a regular part of your workout routine! Our instructors are here to help you find new challenges for whatever your fitness level may be. Strengthen and lengthen your body with our Pilates Mat class. This session focuses on your abs, back, legs, and glutes, helping you develop and better utilize your core stabilization muscles. It’s great for beginners, as well as intermediate and advanced practitioners! Experience the benefits of Pilates in a new way with our Pilates Flow class! This program uses a series of movements to combine Pilates with dance concepts, including breathing, core conditioning, flexibility, and body alignment. Try it for yourself and adjust every movement to your personal abilities and challenges! To build strength without bulk and to develop functional strength that will help you move more easily throughout every part of your day, turn to Pilates and the dedicated staff here at Fit Athletic Club. We are here to help you be your best, whether that’s helping you to craft the lean look you’ve always wanted or simply giving you a chance to take a break from busy everyday life and concentrate on yourself. Whether you are curious about Fit Athletic Club or you want to try out a Pilates class for the first time, you can get a trial pass for free if you contact our team today! 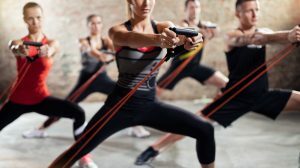 Explore all our group fitness classes to find new techniques to try and ways to better bond with our fitness-minded community, and see what a high-class Houston gym can truly be at Fit Athletic Club. We want to give you the chance to explore our upscale fitness center with no obligation, because we work hard to make it a place you want to come back to again and again. With state-of-the-art equipment, high-quality amenities, a dedicated staff, and a variety of group fitness classes, we know that you’ll see what sets Fit Athletic Club apart. Fill out our online form to apply for your pass today! We look forward to seeing you at one of our Houston gym locations.